Once in a while, pampering yourself and your loved ones is just what the doctor orders. For those indulgent moments, when spirits are high and your wallets are deep, we’ve created a list of luxurious trips you can take, all just a stone’s throw from Delhi. The perfect marriage of the old and the new, Lebua promises luxury and a dose of history. An ideal spa destination in the heart of the Pink City, they promise the best of the culture and tradition Jaipur has to offer, along with world-class facilities. Pack your bags and take off for the weekend. The first official golfing property, the ITC Grand, just outside of Gurgaon, boasts a 27-hole golf course designed by Jack Nicklaus. Pick from the Ridge, Valley or the Canyon course. The property in itself is uber luxe, with a host of wellbeing services. We recommend you leave all your stress behind with an aromatic massage at the Kaya Kalp spa. The Oberoi Rajvilas is almost a replica of Jaipur, with its pink plaster walls. Spanning 32 acres, the premises are full of greenery and even boasts of exotic birds. 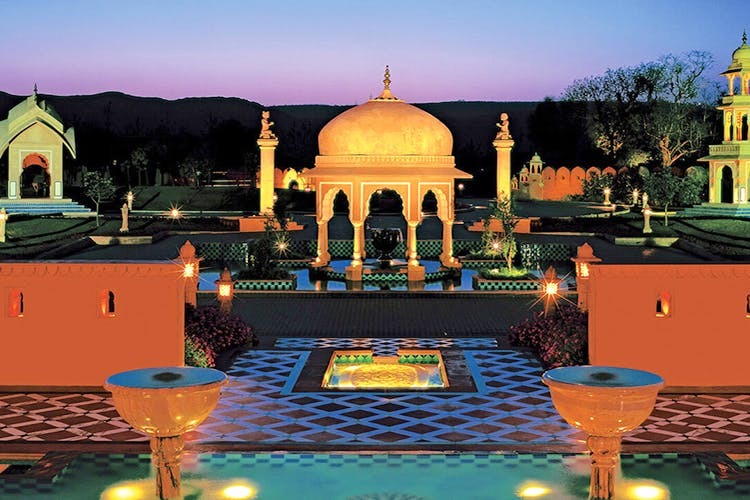 The luxurious resort’s traits include Mughal arches, gold leaf frescoes and elaborate chandeliers. It almost makes you feel like royalty, but with all the luxuries modern life has to offer. Set amidst the Aravalli Hills in Alwar, Rajasthan, the three-levelled resort lies in a compound which was, in ancient times, used by the Maharaja of Alwar as a mobile hunting camp site. The accommodation is state-of-the-art, while still bearing remnants of royalty from bygone eras. The architecture is typically Mughul, and the bedrooms scream luxury, complete with a king-sized bed and a large bathroom with natural light. An ideal stay for those who seek to be away from civilisation just for a little while. A heritage haveli, Bundi Vilas is the perfect blend between the old and the new. Built against the Bundi Garh Palace, the boutique hotel has only seven rooms, complete with all modern amenities. The rooftop restaurant is an especially charming part of the property. With a romantic view of the town, you might want to consider it if you’re planning on popping a certain question. Located on the Delhi-Jaipur Highway, Shiv Vilas is a popular wedding destination, and is ideal for when you’re looking for a weekend of pampering. The 21 acre property boasts architecture that is inspired by historical monuments as the Taj Mahal, The City Palace in Jaipur and the Amber Fort. Their in-house spa offers Ayurvedic therapy, and is bound to chase away all that city stress. For the ultimate royal treatment, we suggest you visit a palace, and no we’re not pulling your leg. The Sujan Rajmahal Palace of Jaipur has been restored to its former opulent glory, with all of the contemporary amenities you look for in a vacation. Take in the splendour the palace has to offer and play royal for a few days. Anything can happen on a vacation, right? Find out more here and read about our experience here.